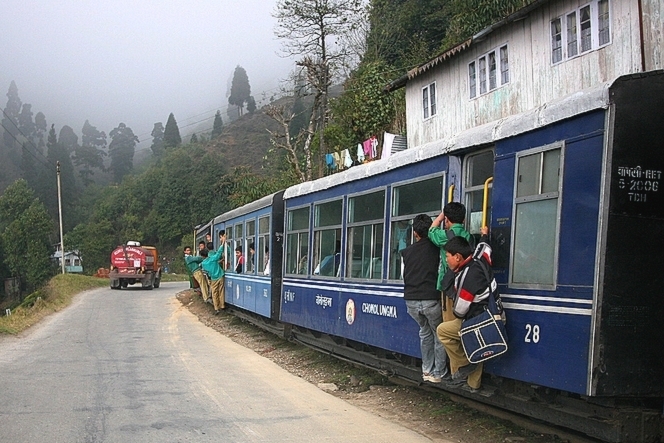 I’m leaving for Darjeeling in a few days. A long trip, hours of plane and four wheel drive. But I go through these hours smoothly as I’m so happy to see these mountains again. Once a year I take with me several people working for Le Palais des Thés. This year Fabienne, in charge of Le Palais des Thés in Lille, Stéphanie from Grenoble, Maud from Paris’ rue-Vieille-du-Temple are coming with me among others. I’ll soon introduce them to you. We are first staying at Tumsong Tea Estate, an organically certified tea plantation of Darjeeling which has such a British cottage (photo) ! It’s a real pleasure to live in such a great house, nestled in the mountains as it is and exquisitely comfortable. All the more so as Rajiv Gupta, the plantation’s manager, keeps an eye on everything and is very concerned of your well-being. We visit his property together, from the factory to the nursery, without forgetting the river’s edge where it’s nice having a picnic. These very British cottages are very common in Darjeeling: in each plantation the manager has a similar building, only the size and the style sometimes differ. You can easily stay there in Tumsong if you wish to as contrarily to most plantations, here tourists interested in tea are welcome for one or several nights (www.chiabari.com). We are also thinking of organizing classes included in Tea School program. Anyone interested? Once the tea is infused you have a wait a little bit of time before enjoying it. I grab this opportunity to smell the wet tea leaves and look around the tasting room flooded with northern light. While in the teacup the temperature goes from the infusion temperature (around 85 – 90 degrees for a black tea) to the tasting temperature (around 50 degrees), I take out my camera and turn around the teacups searching for the best possible angle. There’s no hurry here in Barnsbeg (India), life goes on slowly. I take a picture of the tasting set just for the pleasure of capturing a shimmer or a colour, a shadow or a line on the teacup’s surface. And my thoughts go on drifting, just like a travelling wave. This is call taking time. The time for tea, simply. 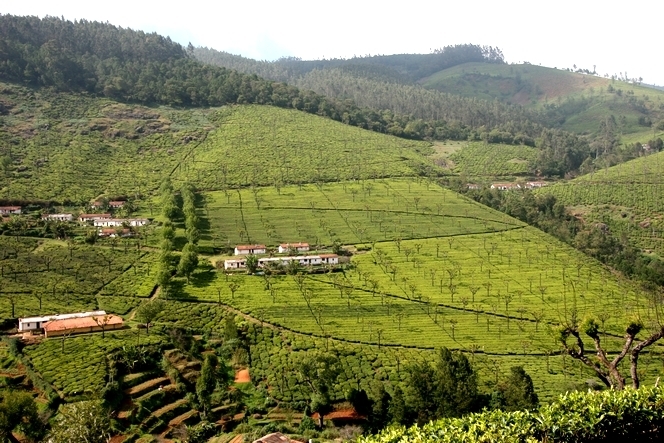 Some tea plantations run by the British are so vast that several thousand people can live there, scattered across several hundred hectares. In southern India, like here in Thiashola, groups of buildings are home to one, two or three families. These houses form small villages where social life plays an important role. Although the buildings belong to the plantation, they are made available to the families as long as they work on the land. So this means that most houses are handed down from generation to generation. A beautiful landscape doesn’t always make a good tea. When I come from Bagdogra (India) and start the three-hour ascent into the Himalayan foothills, I love nothing more than stopping and admiring the view once I get through the stifling heat of Siliguri. The land is no longer completely flat, the city has disappeared from sight, the traffic and the horns have calmed down. Goats doze on the roadside. You start seeing far away above the trees and it helps bearing the heat: you suffocate much less when looking at a clear view. 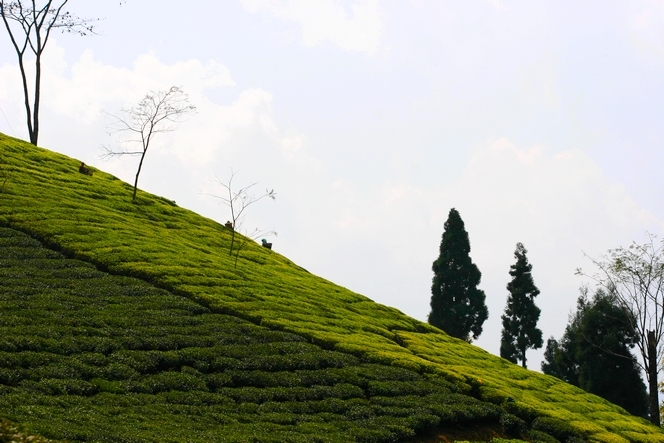 With the gentle breeze and the smell of the earth, I always stop walking between the tea plants. Actually, I must say that they’re not good tea plants. People say that they are Darjeelings, but it’s not quite true: they are just outside the Darjeeling “appellation”, but close enough for dishonest merchants to use them to bulk out the real Darjeelings and cheat the buyers. 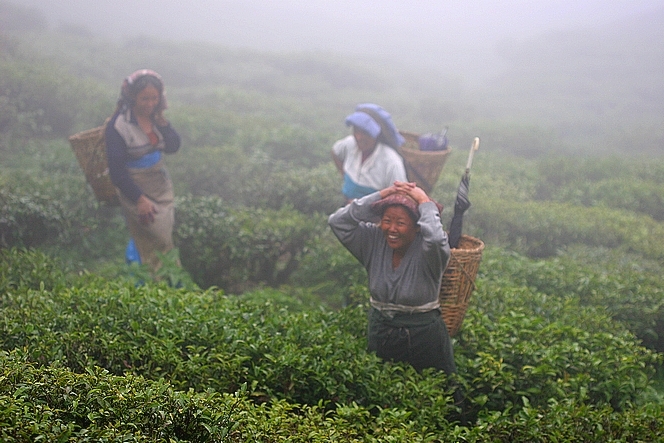 This explains how there is four times as much Darjeeling tea sold worldwide than is actually produced. Never mind, it’s the landscape that is worth admiring here. It is truly magnificent. I’m really attracted to this Terai plain, which used to be a jungle until the British cut down all the trees. People say you sometimes see wild elephants charging around and leopards. I feel good here, so I walk and walk before continuing on my way to Darjeeling. Why beeing in a hurry when it’s so beautiful around? In the middle of summer, a bit of freshness is always welcome. Like this refreshing mist coming from the foothills of the Himalayas. People there are so used to living in the clouds that this humidity is part of their life and no-one pays any attention to it. It’s actually not unpleasant, just look at the faces of these tea pluckers and you’ll see that no-one seems depressed by it. They look like they’re having fun, in fact. 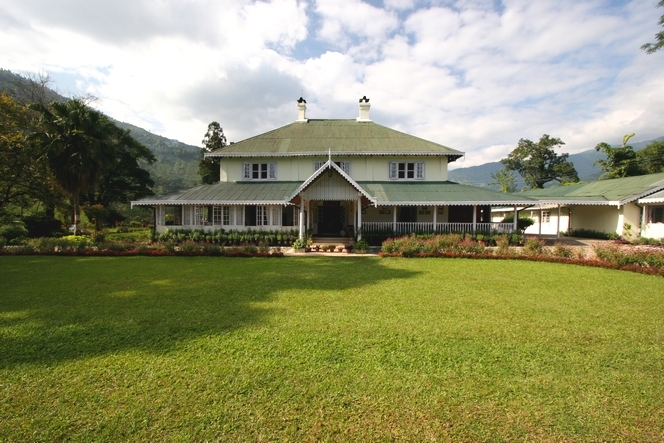 This is at Badamtam, a magnificent plantation located in the north of Darjeeling, across from Sikkim. Just a detail: do you see the umbrella in the basket? Well, it is actually used when the sun comes out, to provide shade and keep a nice complexion. 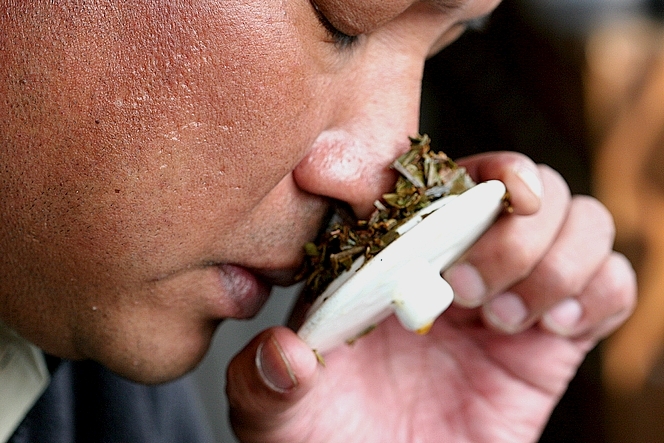 When you taste tea, you first start by smelling it. This is a very important stage in the tasting process. You look at the infused leaves, inhale them and by doing so you already get lots of information on the tea. 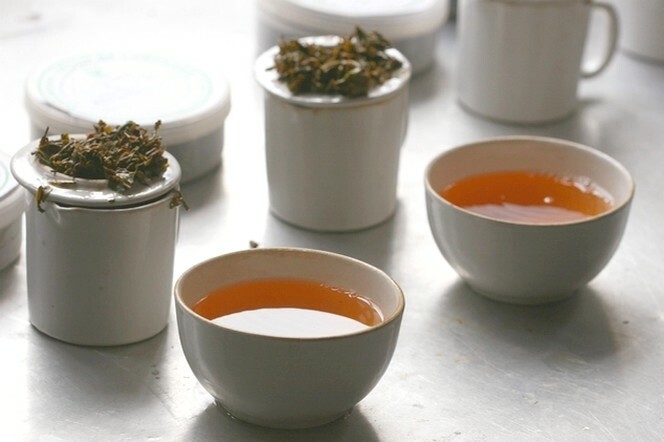 You could for example easily detect problems such as an over-drying, an overly long oxidization process if it’s black tea, or inappropriate fermentation. But of course it also allows you to identify the qualities of the tea and the different scents you could find again in the cup in more or less similar ways. It’s only after smelling the infused leaves (what is called “infusion” in the trade) that we actually taste the liquor itself. Here, in Badamtam (Darjeeling), Binod Gurung has his eyes closed. His nose is plunged in the damp, warm leaves. He inhales, analyses, all in a state of complete concentration. 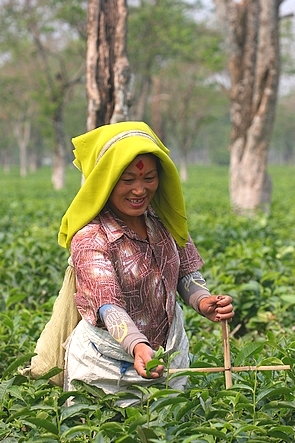 On the Terai plain (area straddling Nepal and India), I’ve seen them use strange crosses to mark the height of tea plants. The cross is stuck into the ground and only the shoots growing above the horizontal bar are plucked. It makes this cheerful plucker look a bit like a tea missionary. Last Friday, I told you about a clever mechanical system developed to make tasks easier for tea pluckers working on steep grounds (see the article). But you may wonder why tea is cultivated on such abrupt fields. Let me tell you why: unlike rice, tea trees like keeping their feet dry and can only be produced on a very well drained area. An inclined ground is therefore ideal for their growth, as the rainwater runs away. 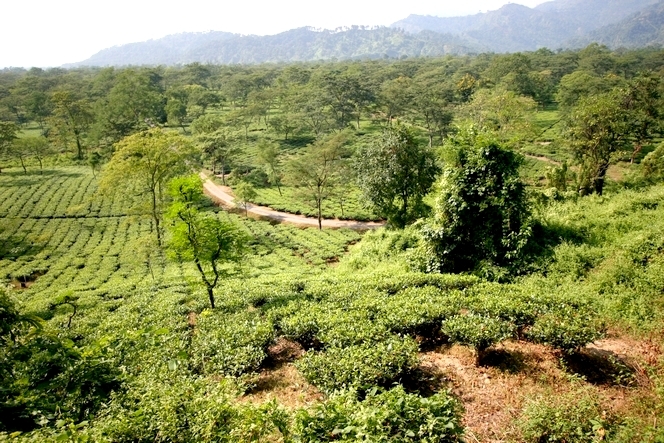 In flat tea plantations, farmers must then install a draining system to keep bushes healthy. It would be as well to make the most of a natural environment, much simpler and less expensive! On this photo taken on the very steep Namring Tea Estate near the Himalayan mountains, notice the tea trees’ difference of colours. On the foreground, the harvest has already been done, whereas in the background, the light-coloured young shoots have not yet been plucked. Tea can be difficult to transport when the ground slopes. I already talked to you about it a few weeks ago, I explained how the horse could be a precious help to transport tea in Nepal (see the article). For the men and women who work on the plantations, it can also be very difficult sometimes to haul up their baskets full of tea leaves. All the more so since the garden where the leaves are harvested and the building where they are then processed are not necessarily at the same height. 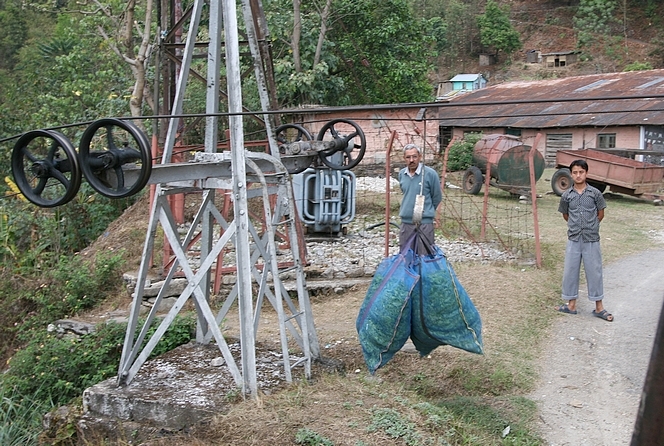 Some tea plantations have thus developed a mechanical system we could compare to a ski-tow, to transport the bags full of tea leaves. At Namring Tea Estates (India) for example, tea pluckers hang two or three bags at the end of a rope fixed onto a cable, which are then hauled up mechanically. A solution making tasks easier for men and gaining time as well. In this photo, Mister Chaudhury and one of his assistants seem to be gazing at these sacks climbing unaided.